• Before connecting or disconnecting the ECM harness connector, turn ignition switch OFF, wait 3 minutes and disconnect battery negative cable. Failure to do so may damage the ECM because battery voltage is applied to ECM even if ignition switch is turned OFF. • Before removing parts, turn ignition switch OFF and then disconnect battery negative cable. • When connecting ECM harness connector, fasten (A) it securely with levers (1) as far as they will go as shown in the figure. A poor connection can cause an extremely high (surge) voltage to develop in coil and condenser, thus resulting in damage to IC's. • Keep engine control system harness at least 10cm (4 in) away from adjacent harness, to prevent engine control system malfunctions due to receiving external noise, degraded operation of IC's, etc. • Do not disassemble mass air flow sensor. • Do not shock or jar the camshaft position sensor, crankshaft position sensor. 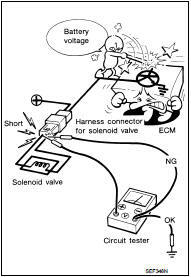 • Do not use ECM ground terminals when measuring input/output voltage. Doing so may result in damage to the ECM's transistor. Use a ground other than ECM terminals, such as the ground. • Do not disassemble fuel pump. If NG, take proper action. • Do not disassemble fuel injector. If NG, replace fuel injector. • Do not depress accelerator pedal when staring. • Immediately after staring, do not rev up engine unnecessarily. - Keep the antenna feeder line more than 20 cm (8 in) away from the harness of electronic controls. - Adjust the antenna and feeder line so that the standingwave radio can be kept smaller. • Cylinder NO.1 is at the flywheel end. • No work should be carried out on the hydraulic system while engine is running. • Remember that fuel pressure values in hydraulic circuit can reach up to 1,600 bar. • Keep hands or face (particularly eyes) out of any high pressure leak. • Recall that fuel is dangerous for health. • Under warranty, do not remove the fuel rail pressure sensor from the rail. • Do not try to measure the resistance of the fuel rail pressure sensor. This test is destructive for the internal components. • Fuel injectors are driven by over 100V. • FUEL injector electronics are polarised. In case of intervention on wiring harness, do not invertwires. It is destructive for the piezo components. • Do not drive the fuel injectors if their body is not connected to the battery ground (risk ofelectrostatic discharge). For instance, fuel injector body have to be in contact with cylinder. • Piezo fuel injector connector must not be unplugged while engine is running. Risk of majordamage to the engine (fuel injector could stay opened).